The National Collaborative for the Study of University Engagement (NCSUE) strives to be a preeminent innovator within the scholarly movement of engagement in higher education. NCSUE deepens the study of and discussion about two key principles—engaged scholarship and the scholarship of engagement—to inform and advance the national agenda. 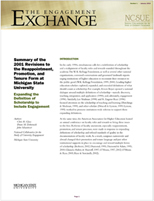 The Engagement Exchange provides faculty leaders and administrators with timely, relevant information to assist them in strengthening outreach and engagement activities on their own campuses.